Potent, selective and reversible AMP-kinase inhibitor. Selective for BMP signaling. Potent, selective and reversible inhibitor of AMP-kinase (Ki = 109 nM). Inhibits AMPK activation induced by AICAR (ab120358) and metformin (ab120847). Selective inhibitor of bone morphogenetic protein (BMP) type I receptors (ALK2, ALK3 and ALK6). Does not affect ZAPK, SYK, PKCθ, PKA and JAK3. Cell-permeable. Please note that sonication in a 55 °C water bath is necessary for dissolution of ab120843 in DMSO to 10 mM. Functional Studies - Dorsomorphin (Compound C), AMP-kinase inhibitor (ab120843)Li et al PLoS One. 2015 Sep 23;10(9):e0138390. doi: 10.1371/journal.pone.0138390. eCollection 2015. Fig 6. G9a inhibition induces autophagy and autophagic cell death through AMPK/mTOR pathway. 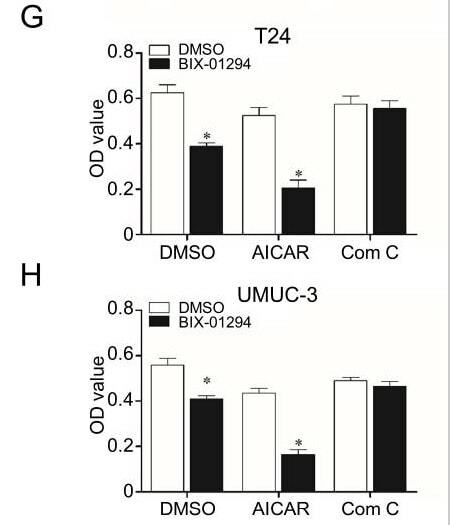 T24 cells (Panel G) and UMUC-3 cells (Panel H) were pre-treated with compound C (5 μM) or AICAR (1 mM) and then treated with BIX-01294 (1.5 μM) for 48 h, Cells viability was assessed by MTT assay. *P<0.01. Publishing research using ab120843? Please let us know so that we can cite the reference in this datasheet. There are currently no Customer reviews or Questions for ab120843.